Berlin’s Jewish Hospital has suspended circumcisions in the wake of a court ruling that the procedure is a crime punishable by law. Approximately 100 religious circumcisions were performed at the hospital last year, in addition to another 200 that were performed for medical reasons. 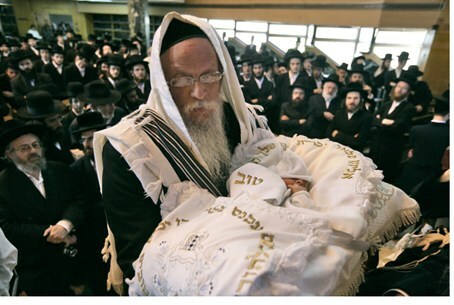 The court ruling set off an uproar in the Jewish community, where the Jewish law requiring circumcision of boys dates back the forefather Avraham and is considered one of the most sacred Jewish customs. Westerwelle is a member of the FDP party, a member of the government coalition and which said it will support a law to make sure that circumcision will continue to be legal. The European Jewish Press, quoting AFP, said that Jewish Hospital Dr. Kristof Graf stated, “We are suspending circumcisions until the legal position is clear." The ruling against circumcision was handed down by a Cologne court, which ruled it causes bodily harm. The case involved a doctor who circumcised a four-year-old boy whose parents later took him to a hospital because of excessive bleeding. Circumcision is widely observed by Muslims, whose clerics have been joined by some Christians to fight the anti-circumcision ruling. A senior Muslim cleric said that the Central Council of Muslims in Germany may appeal the ruling to the country’s highest court.